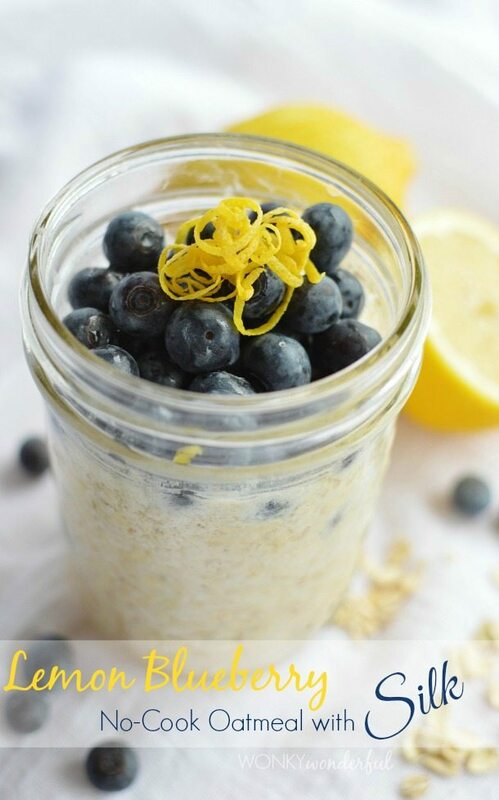 Overnight Refrigerator No-Cook Oatmeal is the perfect breakfast on the go! 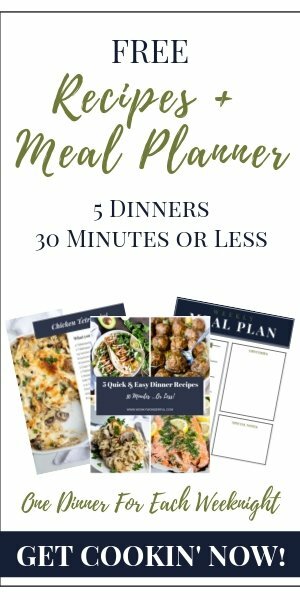 Easy, healthy, filling, made smooth and delicious with the help of Silk Almond or Coconut Milk. Two amazing flavors to choose from: Lemon Blueberry No-Cook Oatmeal and/or Chocolate, Almond & Coconut Overnight Oatmeal. I have a carton of Silk in my refrigerator at all times. For my family, it is absolutely necessary. When my daughter was 18 months old she developed an extremely serious rash in her diaper region. The skin looked like it had been burned. I was worried, frustrated and desperate for a solution. For months we visited doctors and eliminated foods from her diet. Tried every cream and concoction known to man. Finally (after a tip from a random stranger whose granddaughter had a dairy allergy) we eliminated milk from her diet. Overnight the rash disappeared. It was so obvious, the rash had developed as soon as she had switched from breast milk to dairy … Duh. Anyways, to make a long story short. My daughter has been rash free ever since switching to Silk. 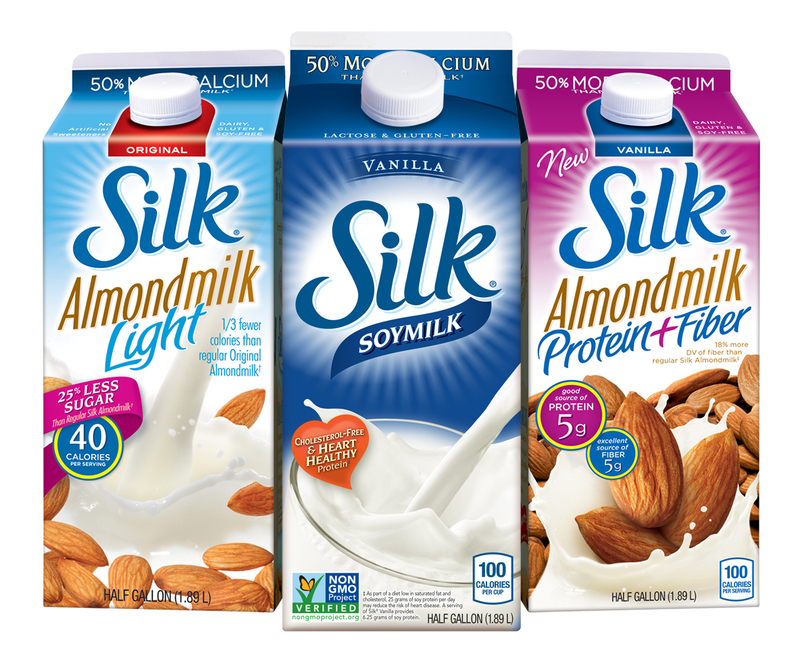 My family has come to love Silk milks. And I don’t have to stress out about my daughter’s health anymore. My favorites flavors are Silk Coconut Milk and the Silk Dark Chocolate Almond Milk. The Dark Chocolate Almond Milk is thick, rich and extra chocolaty. Or make these Overnight Refrigerator No-Cook Oatmeal Recipes for a quick breakfast. It is no secret that I am NOT a morning person. So having breakfast waiting for me and my daughter starts me off in a good mood. Well, as good as my mood gets in the morning. Sign up for a Silk Coupon now and get started making your No-Cook Oatmeal! All new registrants will receive $0.75 off of any Silk half gallon. Silk is non-GMO, gluten-free and dairy-free. So give it a try and bloom! I love using Silk for my Overnight Oatmeal recipes because I prefer the flavor and my daughter can enjoy it. Also, I have tried making no-cook oatmeal with dairy milk and I didn’t like the consistency. The oatmeal made with dairy milk had that gritty, uncooked texture. 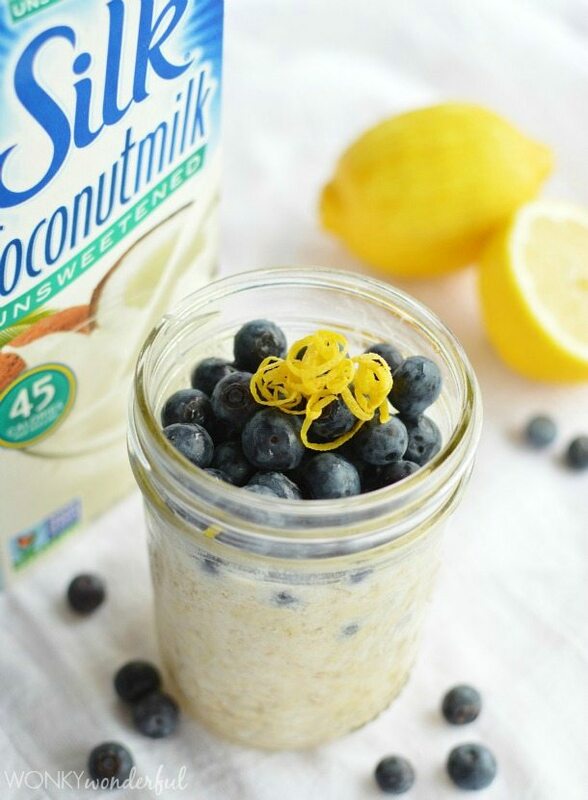 Combine the oatmeal, lemon juice and coconut milk in an airtight container. Refrigerate overnight. 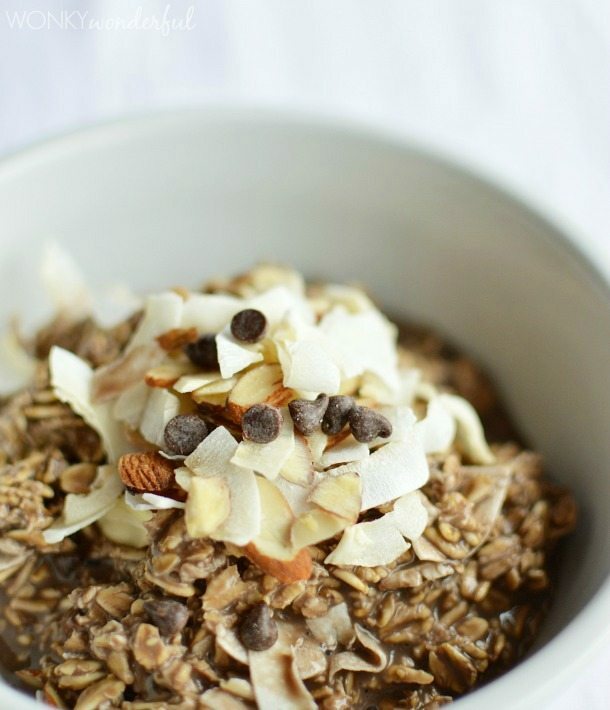 Add an extra splash of coconut milk in the morning of the oatmeal is thicker than you prefer. Add honey, lemon zest and as many blueberries as you want. 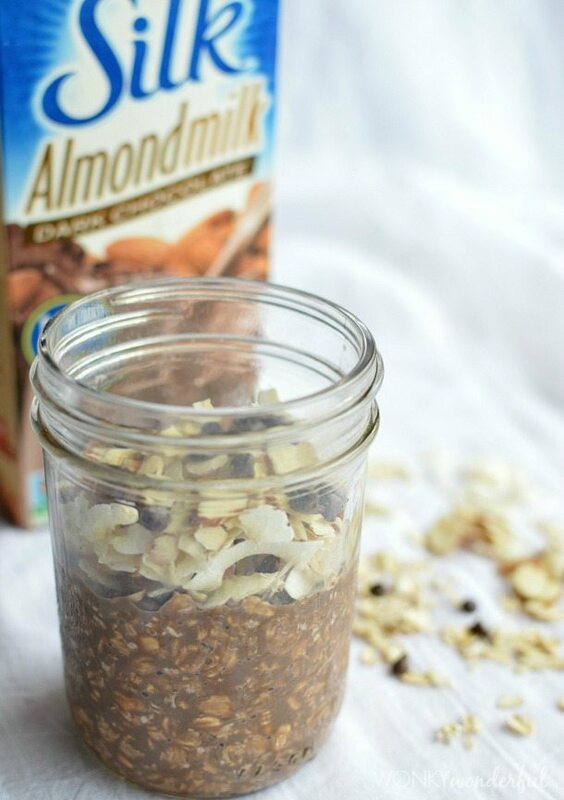 Combine the oatmeal and dark chocolate almond milk in an airtight container. Refrigerate overnight. Add an extra splash of chocolate almond milk in the morning of the oatmeal is thicker than you prefer. Top with coconut, almonds and chocolate chips. Do you eat this cold? If you heat it up how long do you suggest in the microwave? Sorry Maricela, I forgot to give you a suggested heating time. I have never warmed mine up. But I would imagine that it would take 30-60 seconds in the microwave to get it warm. If the oatmeal has been absorbing the liquid overnight, there is no need to cook it any longer. Just until it’s warm. This looks SO good!! Can’t wait for the weather to warm up so we can try it!! Thanks Michele! It is the perfect spring/summertime breakfast!